Today I finally managed to create some little Friday Fun components for you, so today I have two new charts for you that are part of my JavaFX charts library. Nothing really special but fun. 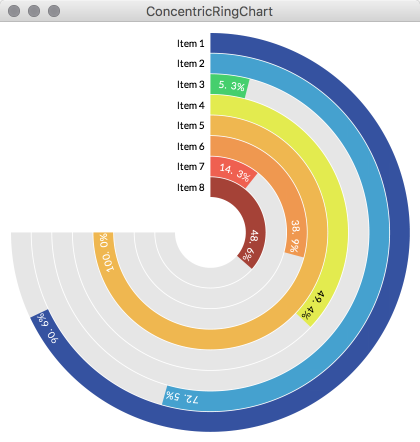 You have a set of ChartItems that you pass to the ConcentricRingChart. The values are always normalized so that the current maximum value fills up to 100%. You can choose between different NumberFormats for the value in the bar and if you click with the mouse on a bar a little popup will show you some information on the clicked item. The upper series goes from left to right where the lower series will be visualized from right to left. 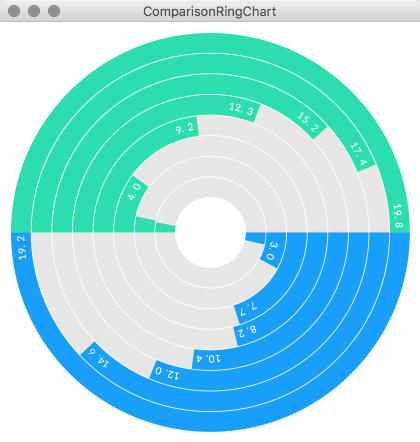 Everything else is exactly the same as in the ConcentricRingChart, meaning to say you also have the mouse interaction and the popup.